Home » Blogging Tips » MILESWEB v/s HOSTGATOR: Who is the best for WordPress Hosting in India? MILESWEB v/s HOSTGATOR: Who is the best for WordPress Hosting in India? We choose everything very meticulously from clothing to gadgets. But when it comes to web server we fail to pay the required attention. Web servers are just not ‘servers’; they are way more than that. It is something which determines the future of your website for years to come. Especially for the startups and small business corporates this becomes very crucial to choose correct hosting partner so that they can concentrate on their online business instead of bushing about errors, storage and backup issues. All of us are aware of the fact that user friendliness, theme support, speed and a lot more things come from a web server. That’s why you need to choose your server wisely for avoiding any hustle later on. So here I am to help you guys out there so that next time you don’t have to waste your precious time looking for best suited server for you. 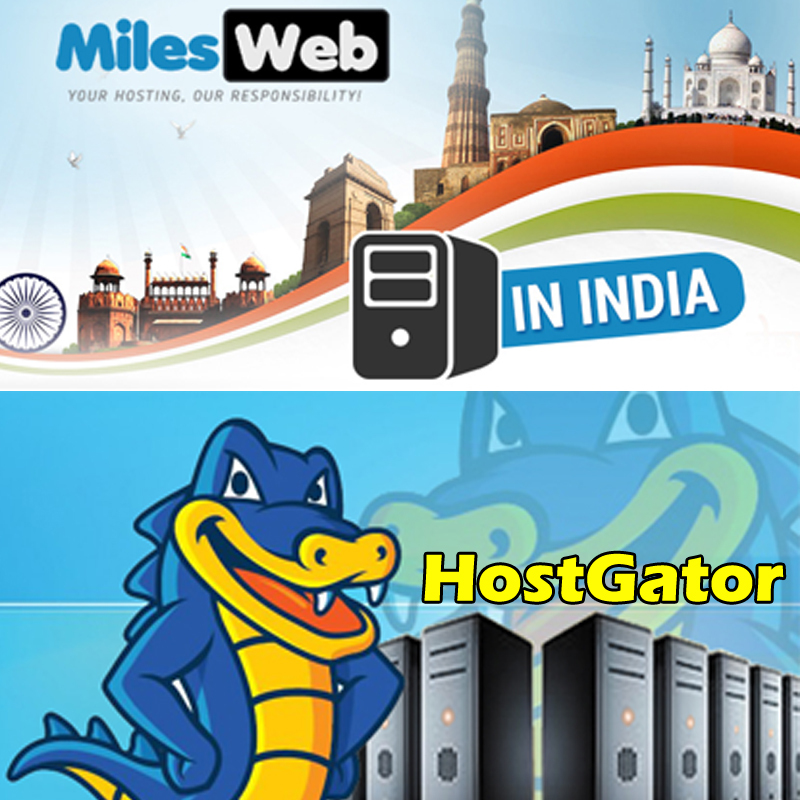 Here I compare two of the India’s best hosting providers MILESWEB versus HOSTGATOR. MilesWeb offers you unlimited hosting and the plan for the unlimited hosting space starts from as low as $3.50/month; while the plan with Unlimited Space on HostGator is the “ Baby plan” costs you around $8.50 straight out! Now it’s very obvious to ask that both the servers provide unlimited space then what to do? Which one to choose? Well, worry not! I have the answer. Both of them are offering unlimited space, but with MilesWeb you’ve to pay only $3.50/month while it’s more than double the price with HostGator. If you need a lot of space then your choice ought to be Milesweb. Hostgator provides transferring of your existing WordPress site to HostGator. Consultation services are included with some plans to help you. While milesweb provides even more easier WordPress Installation. MilesWeb team will help you to get your WordPress blog online in no time. Their best WordPress hosting packages come with preconfigured Apache, PHP, MySQL and other required component. You don’t need to do anything big for installing WordPress, it can be done with just a few clicks with Softaculous in MilesWeb. In MilesWeb the whole migration process is at a few mouse-clicks with no limit on free transfers. While HostGator provides a limited number of free transfers from other hosting providers, or inter server transfer between HostGator servers for new accounts, would be done within 30 days of signup. Milesweb provides Free SSL certificate for unlimited domains. While hostgator charges an amount for providing SSL certificate. Well, why would pay for something which is available free of cost somewhere else? You should not. Customers have every right to pick up the one they choose. So this time the choice is yours. MilesWeb provides free spamExperts for one domain with eligible hosting plans while same is not the case with hostgator. HostGator does not provide free spamExperts for Incoming Email Spam protection. Both Milesweb and Hostgator provide interactive Cpanel for you to manage your files and both are loaded with the one click CMS installer Softaculous too! So yes! Competition is quite tough here when we talk about interactive panel. Here both the webservers are neck to neck competitors. Convinced with the features, still not sure about which one to choose? I hereby add another advantage of choosing MilesWeb. Milesweb provides anytime money back and 99.95% uptime guarantee while hostgator provides money back policy only within 30 days of installation. MilesWeb and hostgator both provide excellent and convenient account set up services. 24x7x365 Support: since both the servers are toughest competitors in the industry so how can any one of them lead or lag. Of course, both of them are available 24x7x365. So this was all about MilesWeb and Hostgator. In fact I cannot locate a single reason why not to prefer MilesWeb over HostGator or any other web server. Its features and excellent performances, security and backup, closest to zero downtime, MilesWeb has always beaten its counterparts. MilesWeb has tech enthusiastic and well-trained professionals at customer service. It is gaining popularity and proving its mettle time and time again. So far MilesWeb has always stick to its timeline ”Your Hosting, Our Responsibility”. With a hosting partner like MilesWeb, customers can concentrate on their business ideas to get heavier mileage on their website and transverse to greater heights. Now I guess! You probably have a good idea about which server is better. Undoubtedly it is MilesWeb which wins the race with astonishing features and promising services at an amazingly pocket friendly rate. Milesweb and Hostgator, both are leading web hosting providers in market. But when it comes to selection of service provider, milesweb always having slight edge. Because the add-ons that they have provided to customers. They having best tech-support available which makes them more reliable service provider. Always recommended as web hosting service provider. I was planning to start my own company of web sites design and was looking for a good inexpensive hosting company for my Joomla web sites.I found MilesWeb on a Google search. They offered competitive price for hosting along with a lot of Joomla Templates. And my journey began with MilesWeb.I has no reason to look for a different host. After eight months, I now have 4sites hosted with MilesWeb. I am completely satisfied with this company, and very impressed. I will define MilesWeb in short – Consistency in service, Money back guarantee, 100% Uptime of website, good bandwidth, excellent support with great knowledge!!!! I was little bit confused for selecting webhosting as I need to transfer my website to new hosting. But reading this review I think I should choose MilesWeb. Thanks for sharing such an informative article. I have used both milesweb and hostgator services, but in my opinion, milesweb is best web hosting. There support is excellent, which makes them more countable. Always recommended. I’m using MilesWeb service because of their quality services and affordable packages. Till now I never get any issue regarding server downtime or anything else. I am very happy with MilesWeb. Recommended service!